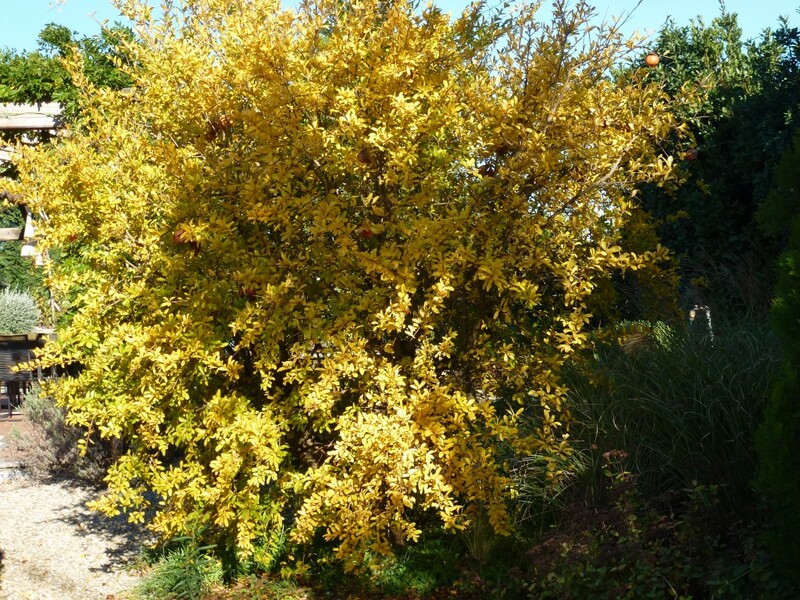 I. unguicularis is a vigorous evergreen rhizomatous perennial to 30cm in height, with copious dark green leaves and very fragrant, deep violet flowers 5-8cm in width, the falls marked with white and deep yellow at the base, in late winter. 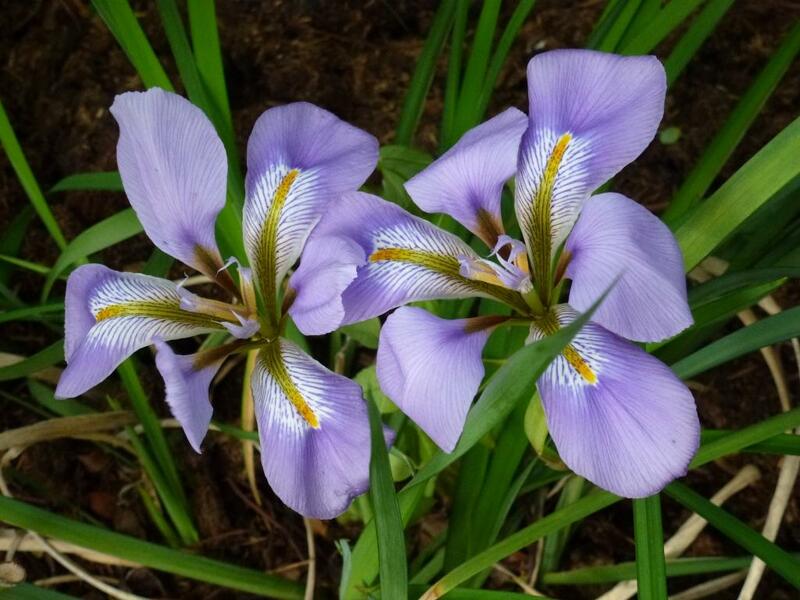 OK so it’s not late winter and my plant isn’t evergreen but I am sure that this lovely flower is I. unguicularis. 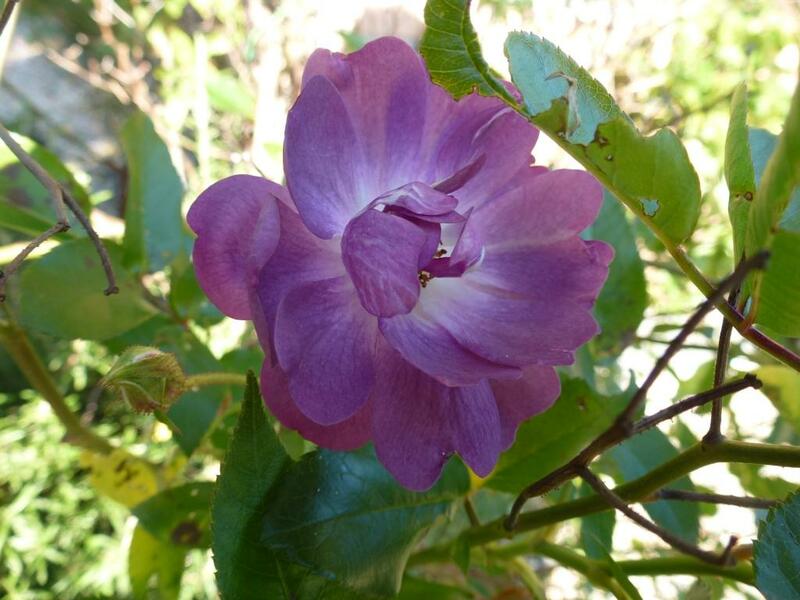 A friend gave me this plant at least 3 years ago; I planted it under the Rosa mutabilis as I felt it would be undisturbed there, sadly it is now covered by the rose and I am going to move it. 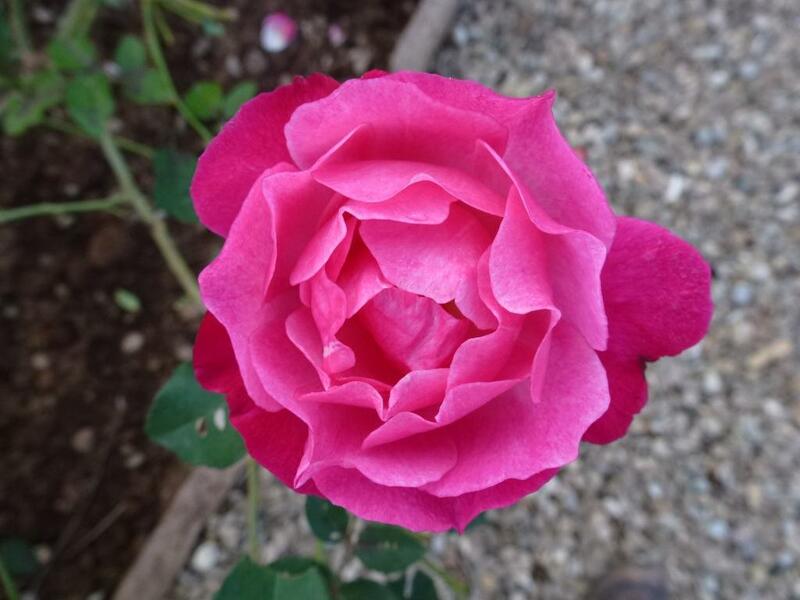 It takes a while to establish before flowering freely so I move it when it has finished flowering. There are only a few things I miss about not living in England and most of those are garden-related. Bluebells in spring (I have wild cyclamen in autumn here which I love almost as much), spring bulbs in everybody’s gardens, the possibility of visiting inspiring gardens easily and, at this time of year, the changes of colour of foliage of trees and shrubs. It’s not that there is no change in colour at all; the pomegranate turns a love bright yellow before the leaves fall, the apricot is taking time to lose its foliage and that too turns an appealing yellow, but there is very little more. Cotinus look more or less the same colour they’ve looked since spring and I doubt they will become the gorgeous red that I’ve seen in other gardens around the world. The walnuts changed to a brown-yellow before quickly falling. Oaks hang onto their foliage here in the same way that beech does in the UK; the dead foliage persists until the new foliage appears the following spring; I don’t find this characteristic as attractive in trees as I do with beech or hornbeam hedges. I planted two Lagerstroemia (crape myrtles) because they flower very late August and into September and maybe even October when they are larger and their foliage does change to an attractive red in autumn. 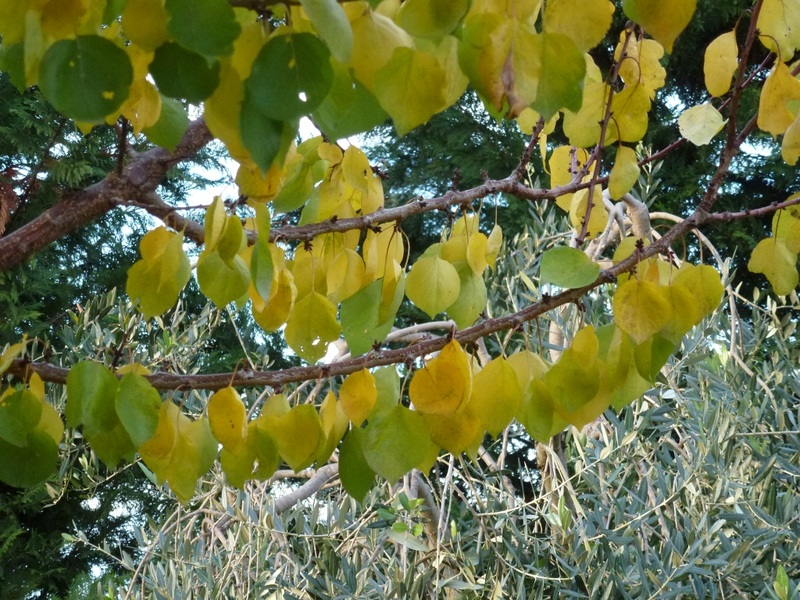 But nothing very exciting, the main autumn colour here really is fresh green, which is welcome after the drought of summer. 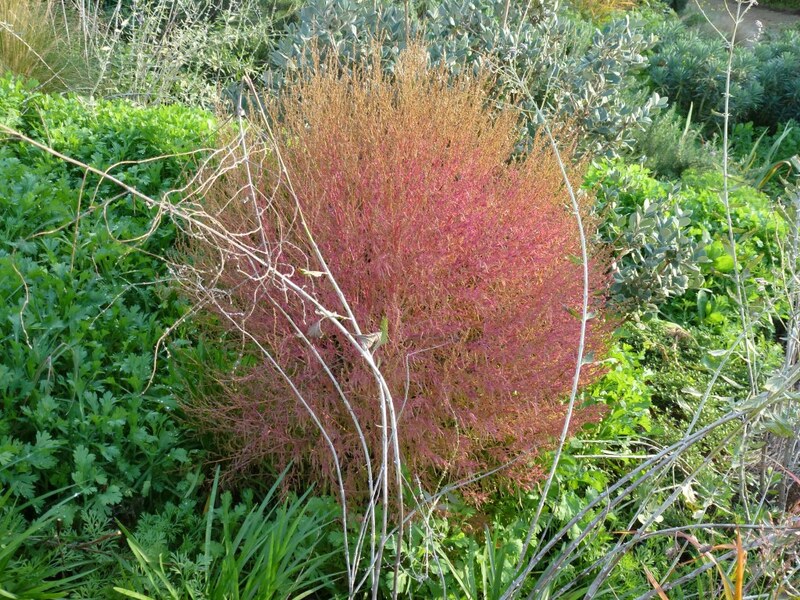 Kochia trichophylla, an annual does provide some deep pink in that the flowers, seeds and stems of the plant all change to an exciting crimson as autumn progresses. 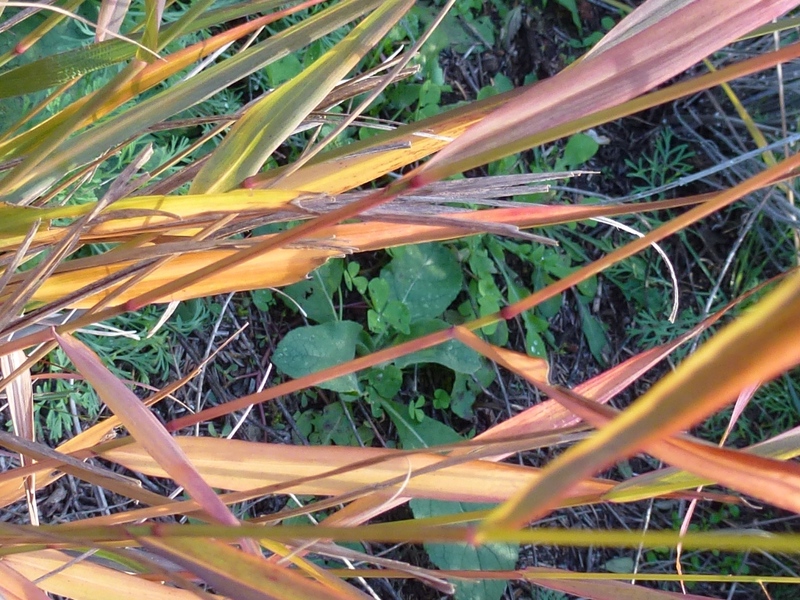 Some grasses also delight me with their change of colour but most of their interest derives from their flowers. 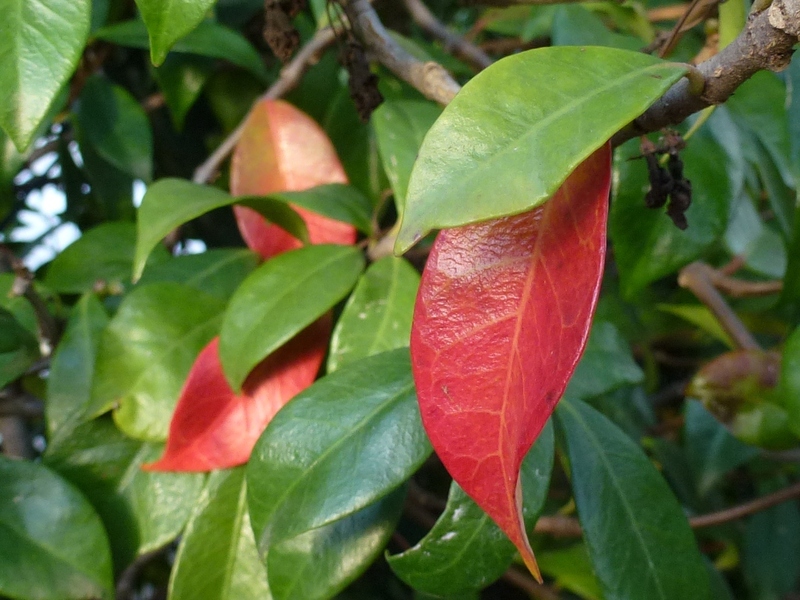 Evergreen Trachelospermum jasminoides tries hard with some leaves turning to the best red I have in the garden but only a few leaves do this the rest remaining resolutely green. Looking at these images you might think I do have some autumn colour but it really is very limited, so I have been reading with great pleasure posts from the UK and the US full of wondrous, breath-taking colour, feasting my eyes on such an incredible range of foliage colour I almost wonder why anyone gardens for flowers at all! I’m adding links to some great posts but I’m eager for more. To join in GBFD just write your post and add your link to your comment here. I’ll be just as interested to see some spring/early summer foliage from the Southern hemisphere. 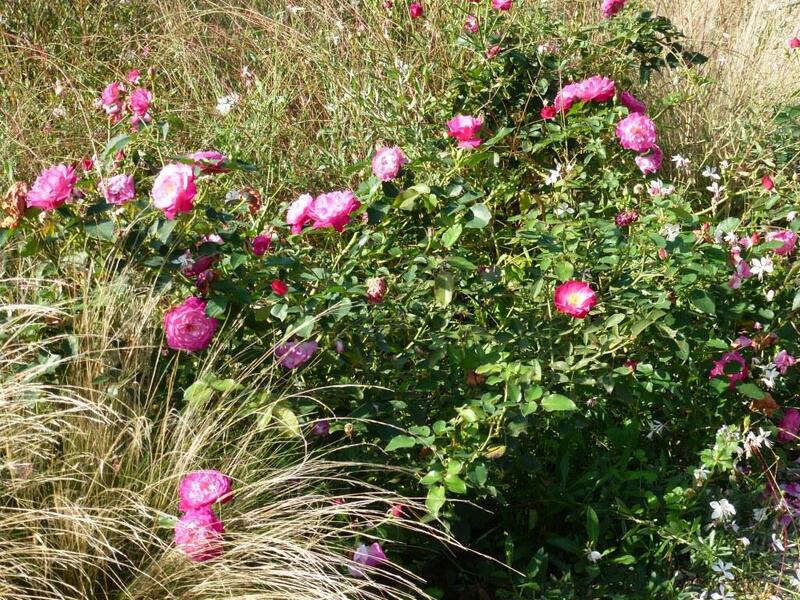 Debbs Garden Journal has a wonderful woodland as part of her garden, at this time of year it looks wonderful. Here are three posts you might enjoy. One, two, three. 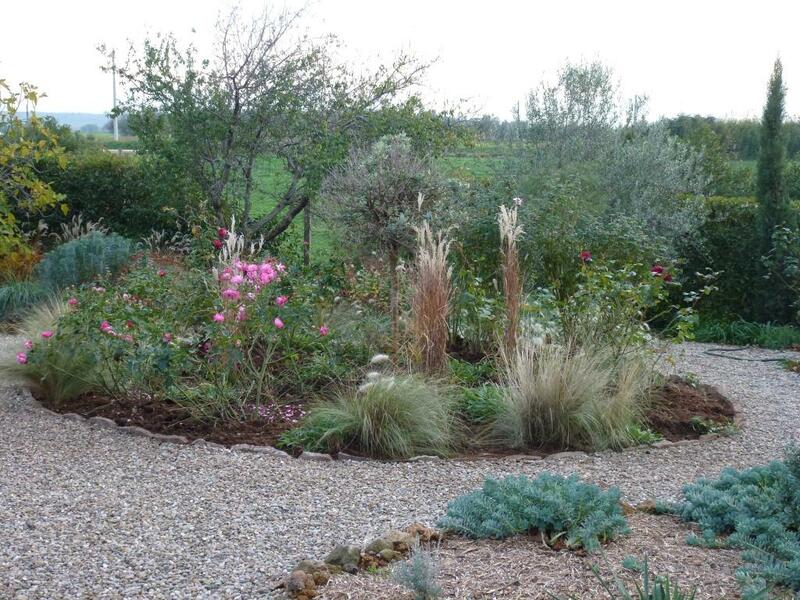 Pauline at Lead up the Garden Path has also posted a couple of times sharing the colours around her in Devon. The Golden glow of November and about a glorious visit to Westonbirt. To all my US readers have a very happy Thanksgiving. The brassicas I planted early (soon after the onion beds had been cleared and it was cool enough to plant anything) – I think it was the end of August have grown really well; probably the best I’ve ever grown. They are squashed into the bed too so that everything touches everything else. We’ve eaten lots of superb broccoli and secondary stems are already growing and I can’t keep up with the pointy cabbages, they are splitting before I can get around to harvesting them, but it is the red cabbages that have looked so beautiful in the bed especially the one right on the corner of the bed (which is obviously benefitting from more light than the others). 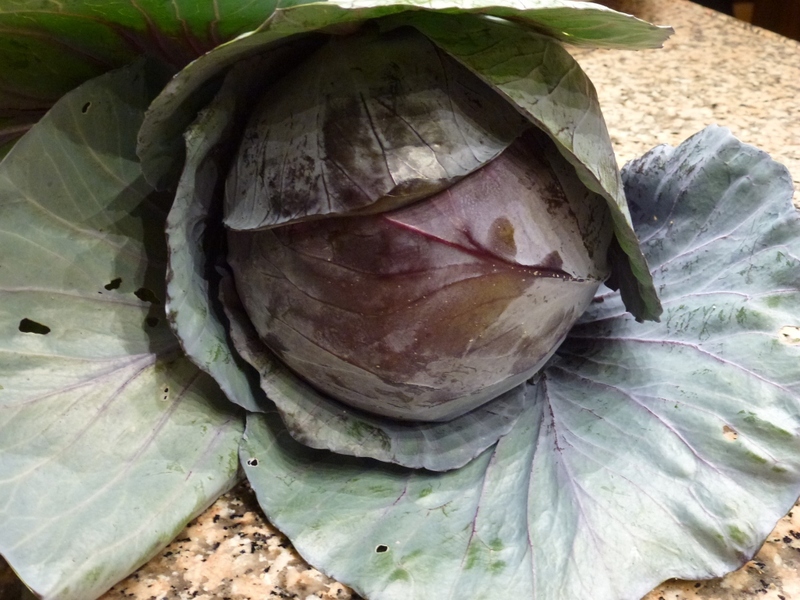 The red cabbage recipe is a classic and the recipe I follow is from the ‘Cordon Bleu’ series of, I don’t like to think how, many years ago – but a really good recipe is always a good recipe. The cabbage weighed in at a hefty 2 kg and 100 grams (ALL my metric weights) good job I’d taken off all the outside leaves before weighing it! The colour of the leaves was so beautiful, like shot silk, luminescent an impossible sage green with red, the camera hasn’t captured it but you get the idea. 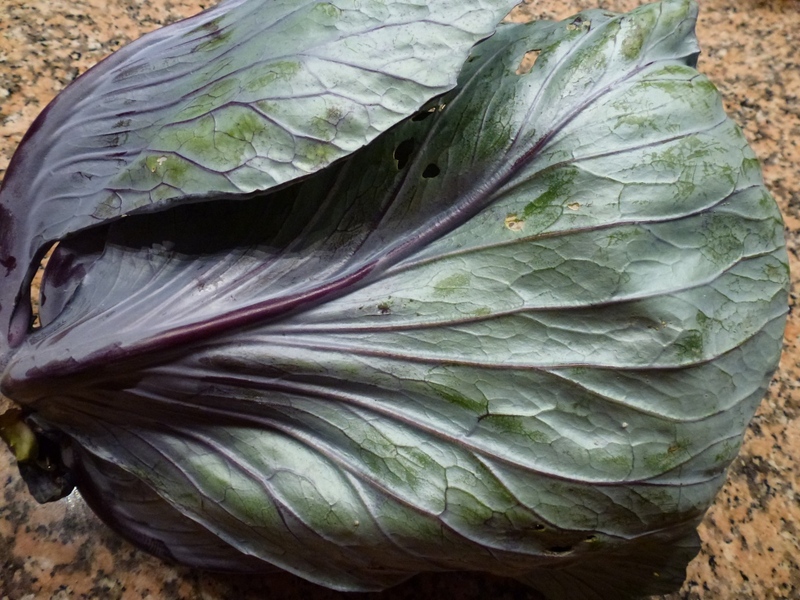 Cut 1 kg cabbage into shreds and plunge into boiling water and cook for 1 minute. 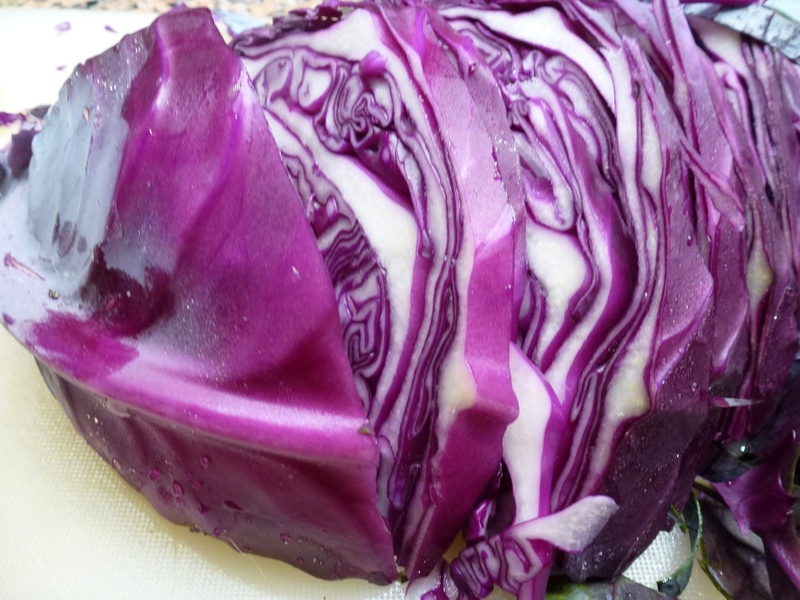 The cabbage turns an unlikely violet blue. Next chop 2 large onions I used red ones because that’s all I have left and soften in butter (or olive oil if cooking for Lucia). Peel, core and slice 2 apples and add to the onions and cook for a couple of minutes. 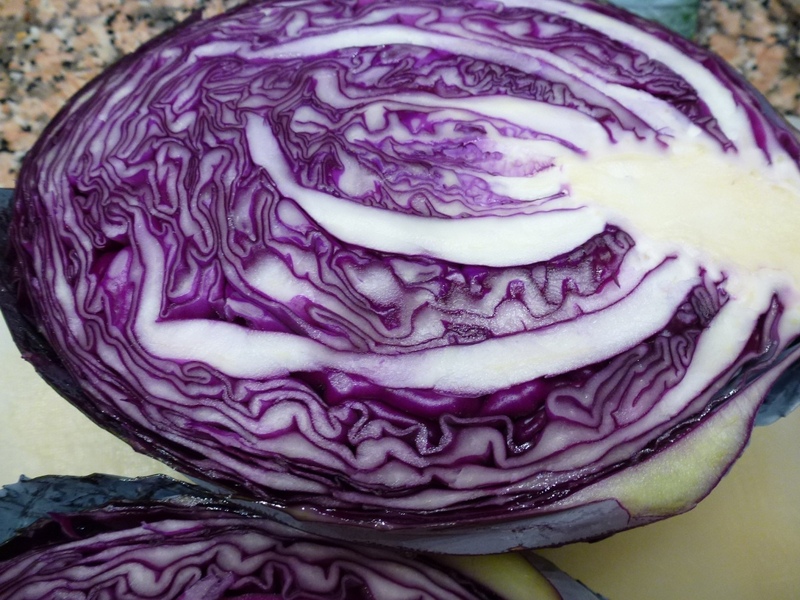 Layer the cabbage, onion and apple in a large ovenproof casserole and season each layer with salt, pepper and a little vinegar and water (in theory you need 3 tablespoons of vinegar and 2 of water ) I just go my eye but being careful not to add much vinegar. At this stage the cabbage changes back to its more appetising red colour. Put in a low oven 170° C and cook very gently for 2 hours. Here the recipe says to add kneaded butter to thicken the juices, I never find this necessary (and for Lucia I couldn’t use butter anyway! ).This is good served with braised meat, sausages or with cold turkey. Nice to have some ready-made in the freezer for when you don’t want to do any more cooking after Christmas day. Well, mostly anyway! 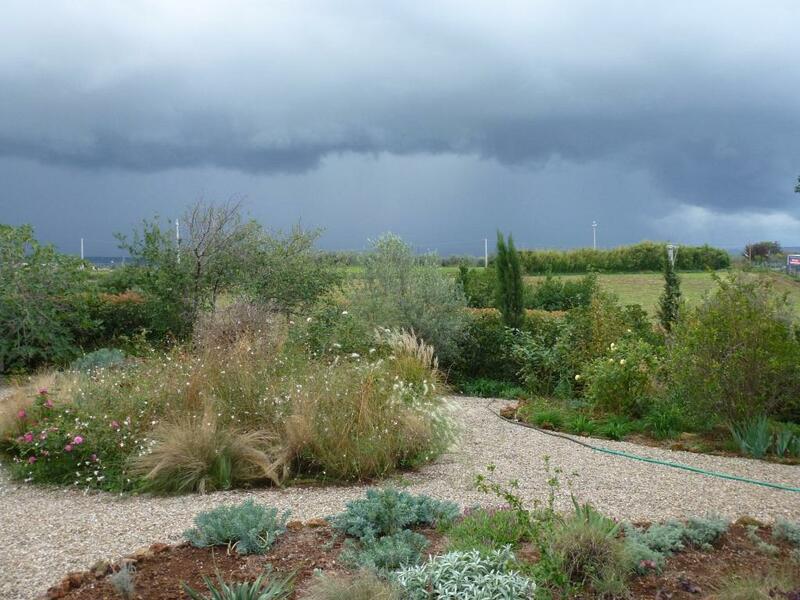 The weather since the last BloomDay has been good for the garden; rain and warm sun. 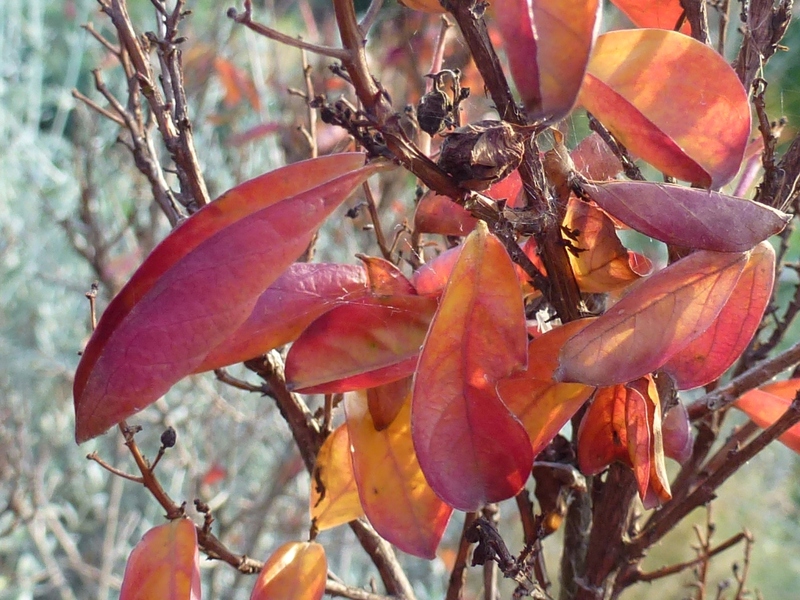 Most plants have been tricked into believing that it is spring rather than the beginning of winter. There has been a lot of rain in the last weekend; many of you will have seen images of Venice and maybe of road collapsing and swallowing a car in Tuscany. For more about the rain click here. 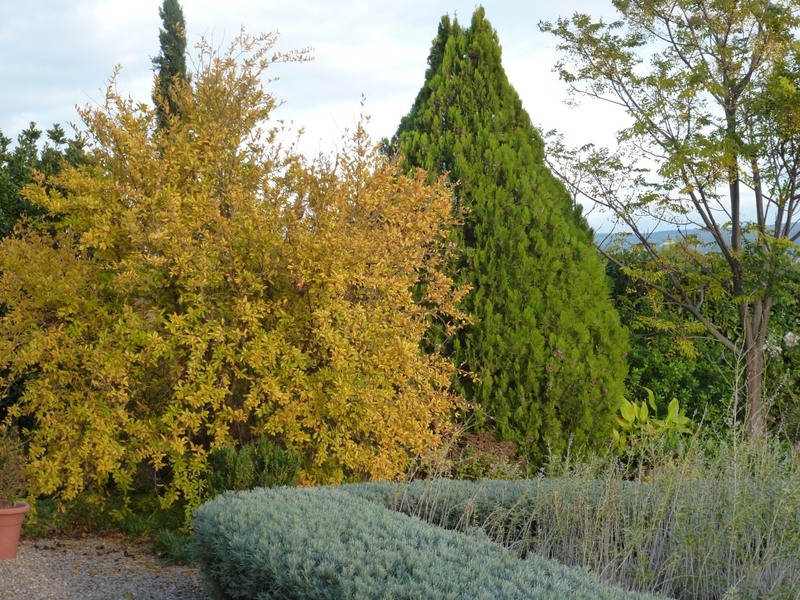 There is some autumn colour, the walnuts have lost their leaves, the pomegranate foliage is butter yellow and all the Miscanthus are looking beautiful but other plants are enjoying a second spring and I’m enjoying it too; in a small way it makes up for the torrid summer. 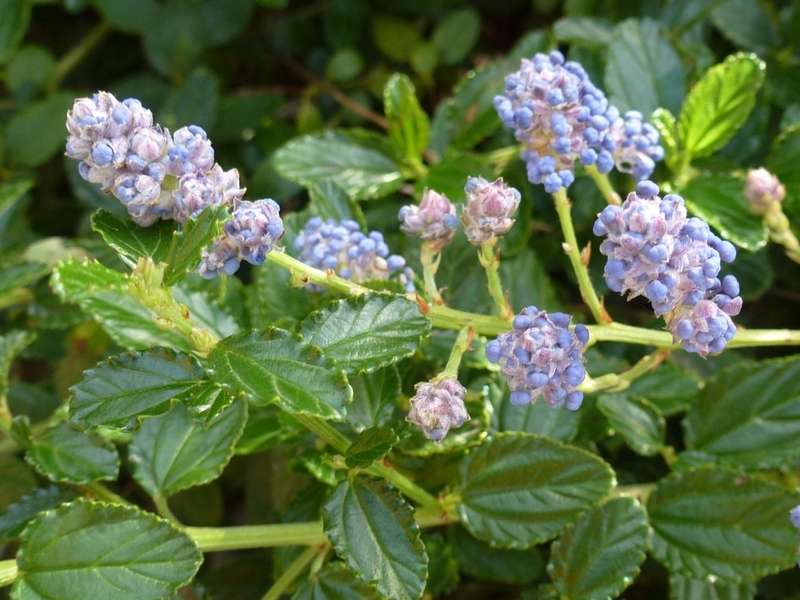 Ceanothus has a few flowers the blue of the blooms matching the blue Italian sky. One Cistus has one flower (yes, I know that one flower proves nothing it is an anomaly). 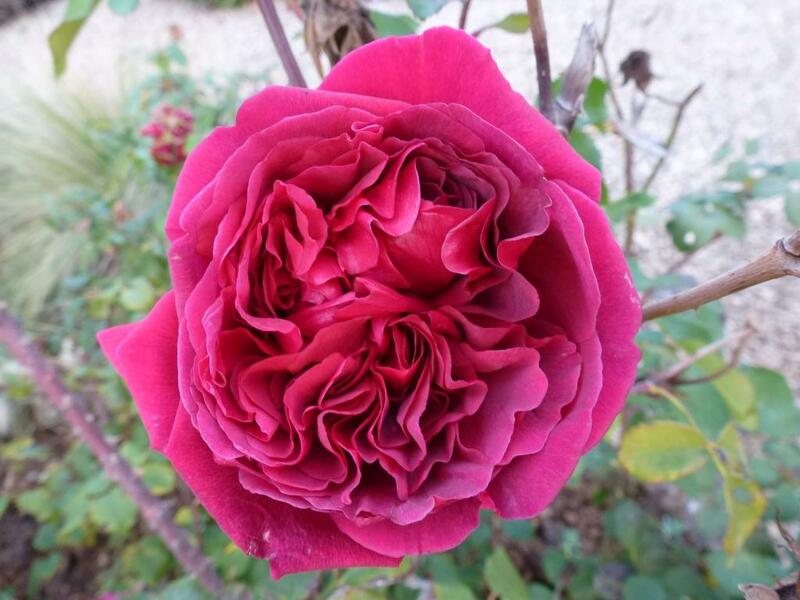 The moist ground has really prompted the roses into flower, there are more, even, than in October. 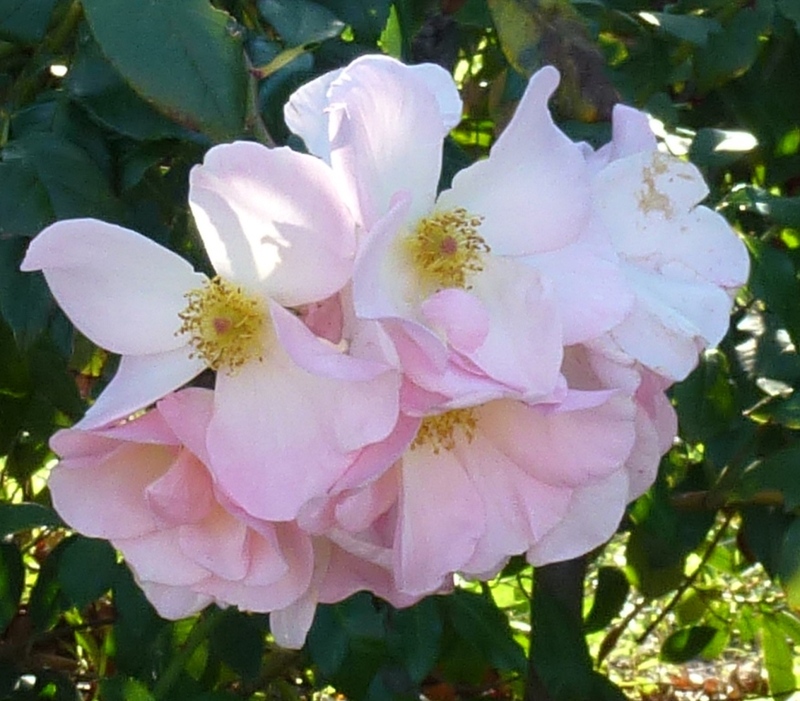 During the early days of November I was surprised and delighted to see that the ends of all the branches of the Philadelphus had flowers, they only persisted for a week or so, so can’t be included in Bloomday for November but they deserve a mention. Solanum jasminoides Album is covered in blooms and will probably continue to be until some really cold weather arrives. All the different varieties of Salvia are flowering profusely, I think I under-value them because I find it hard to get good images of them. This post is late, yesterday I wasn’t feeling great so didn’t go into the garden to photograph the blooms, today it is very windy and the bright morning sun has made some of the colours a little strange. 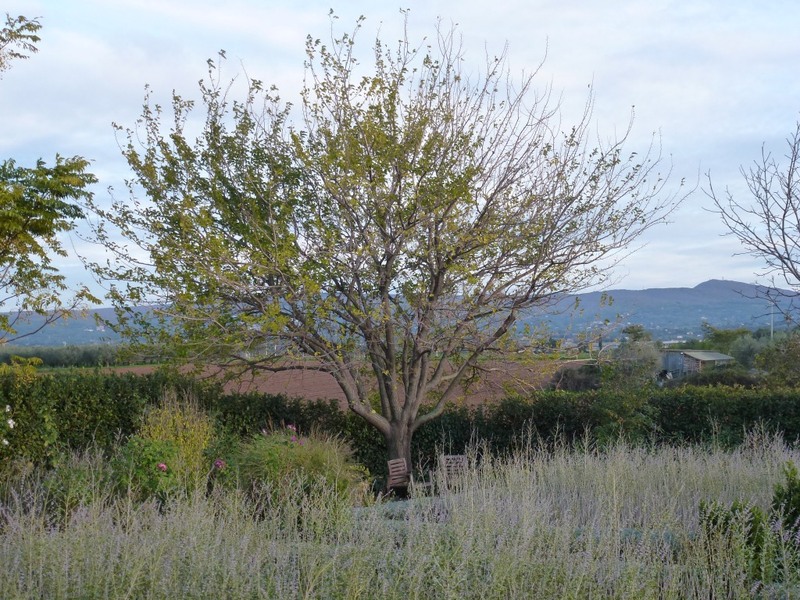 You can see most of what’s blooming in My Hesperides Garden by clicking on the image below. 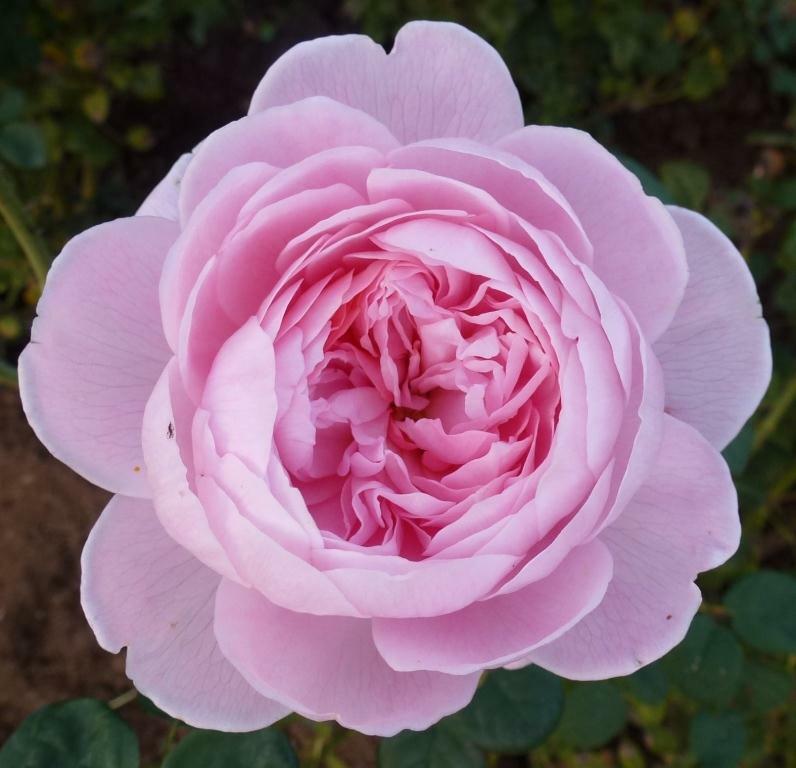 Thank you to Carol at Maydreams Garden for hosting this interesting meme, take some time to visit some of the other gardens joining in this month to see what’s blooming around the world. 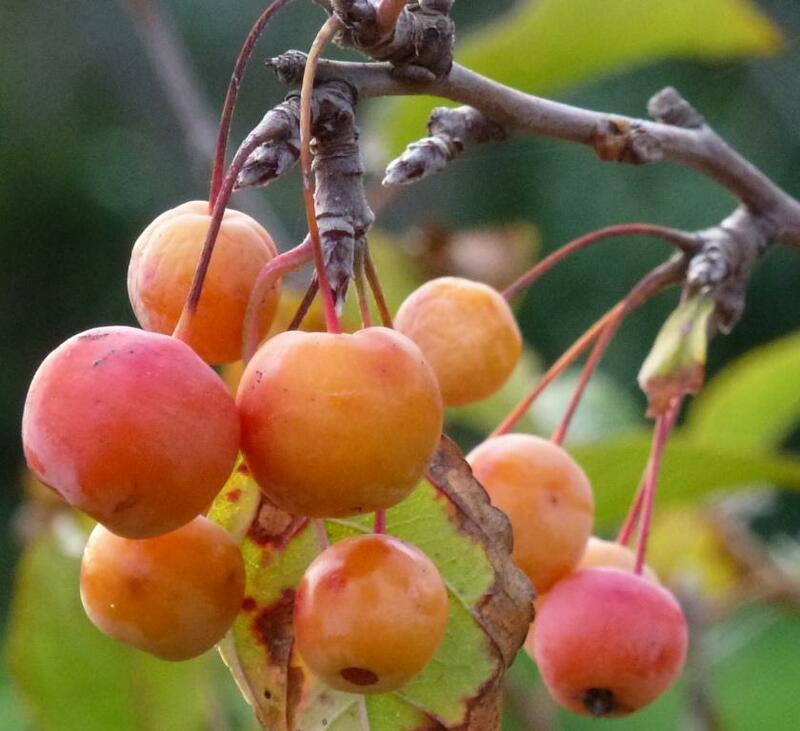 I’ve been reading some wonderful posts about autumn foliage colour, please feel free to link to Garden Bloggers Foliage Day on the 22nd of each month – I think November may be the most colourful so far! The weather has been pleasantly warm for most of November so far; the central heating has not been switched on and the fire we light in the evenings is more for the pleasure of looking at it than the heat that it produces. 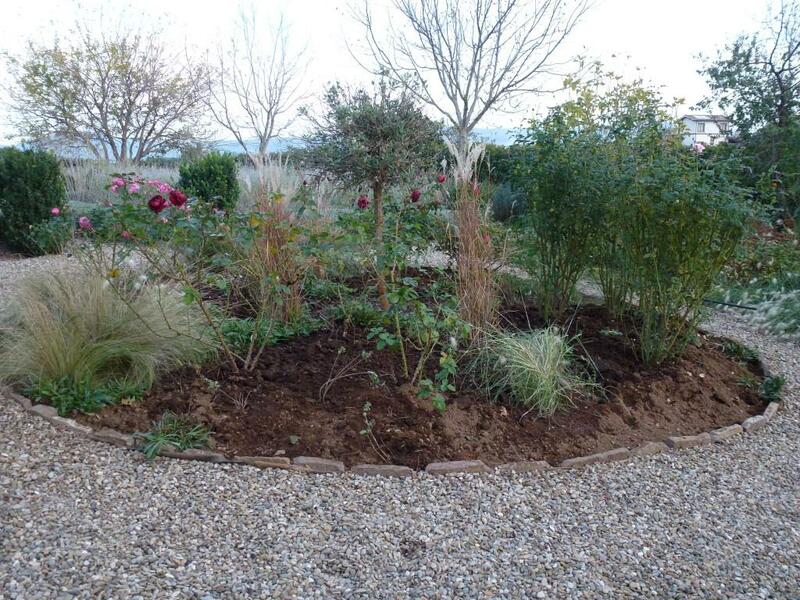 September, October and early November has been perfect for the garden, the warm sunshine plus a good amount of rain. There have been very sunny days and very rainy days so easy to decide what to do and to be able to enjoy the good days and be grateful for the rain when it comes. Rain was forecast for last Sunday so I thought it would be perfect to have a lunch party for my gardening friends as none of us would want to be outside! Often when I make plans like this, things go awry; the sun shines hotly down making everyone wish they were working in the garden rather than eating! Last Sunday the forecast proved only too accurate! It began raining during the night and continued heavily for most of the morning; about an hour before our guests were due to arrive we thought it might be a good idea to check the state of the lane to the house. 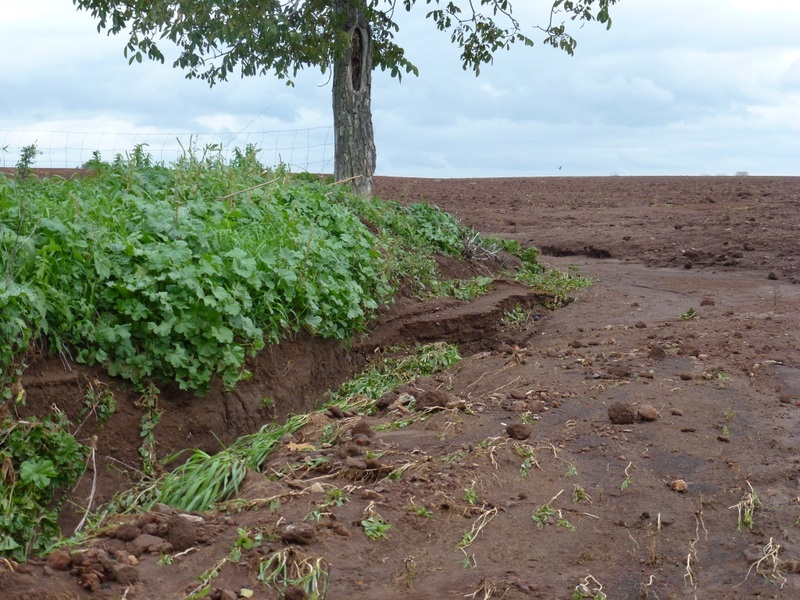 Last year when there was torrential rain the lane was covered by about 30 cm of topsoil from the neighbouring field. So had the farmer learnt from last year’s disaster? Had he decided to plough and plant seed early so that the precious topsoil wouldn’t be washed away? NO! HE HADN’T! 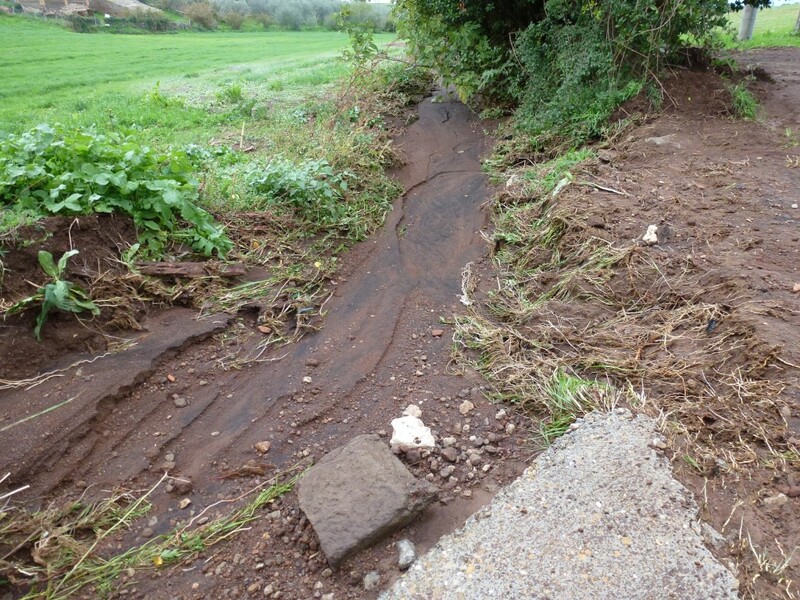 So with only a short time before four cars would be arriving we found the lane in front of our gates with a thick layer of MUD and worse still the ditch into which our grey water drains completely filled with mud for a distance of about 100 metres. 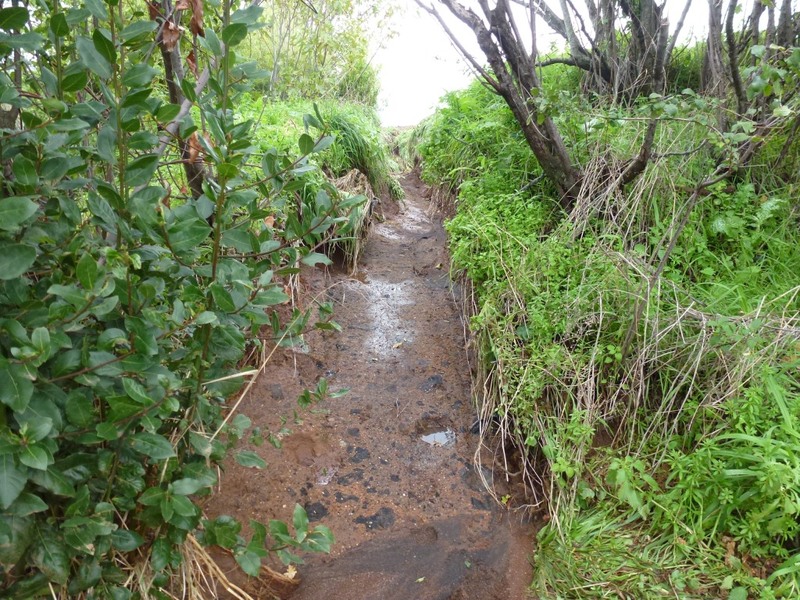 Water rushed along this old stream bed carrying top soil, stones and boulders. 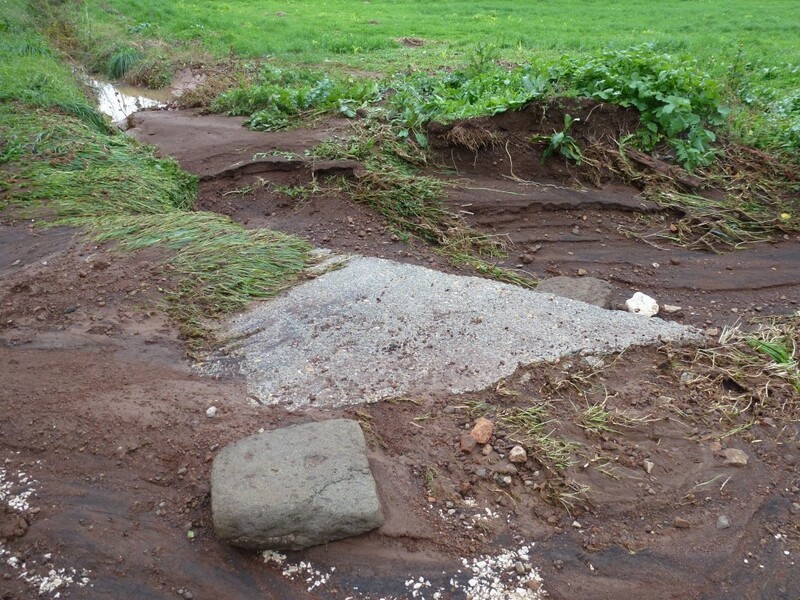 The power of the water means the stream bed is now just tuffo rock. But I’m not complaining (well not much anyway). People lost their lives due to the torrential rain; a car disappeared into a chasm created when a bridge collapsed; the three occupants of the car died of asphyxiation deep within the mud in Tuscany (not so very far north of us). People have lost their homes and everything in them; it is not so common here as in the UK to have home insurance so this is truly a disaster. We were extremely lucky, the shepherd came with his tractor and flattened out the mud and our guests were able to drive through with no problems, thank you Amadeo! Water is such a powerful element, Global climate change means that many places in countries all over the world will suffer severe flooding on a regular basis. We must all try to encourage our governments to reduce the causes of global climate change rather than them begging for help to deal with its results.